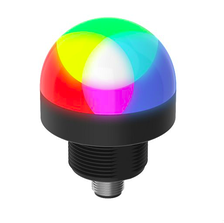 The K30 Pro multicolor indicator is a compact indicator held within a 30mm illuminated dome providing bright status indication with three inputs and seven standard color options. The polycarbonate housing is rated at IP66, IP67, and IP69K, meaning the indicator can withstand high-pressure, high-temperature situations. The simple wiring allows for quick installation and consolidated controller outputs. A variety of additional programmable color and animation options can be explored through the Pro Editor Software provided by Banner Engineering. 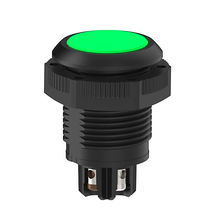 The K50 Pro Series Multicolor Indicator is highlighted by its IO-Link communication that greatly multiplies its possibilities and applications. The indicator can be fully controlled and parameters such as flashing, dimming, and advanced animations can be tweaked through the IO-Link. If the need ever arises, you can even opt for a model without the IO-Link. The housing is made out of polycarbonate and is rated to protect against extreme pressure and temperature conditions. All models are constructed with FDA-grade materials meaning they can be used in the food industry as well. The WLS27 Series Multicolor LED Strip merges bright illumination with heavy-duty build quality, making it viable for a wide range of applications and harsh environments. The models are available with either three or five colors and lengths ranging from 285mm–1130mm. Daisy chaining is also possible through an integral 4-pin M12 connector. The housing is made out of chemically resistant copolyester, is water resistant, features a laminar flow, and is rated at IP66, IP67, and IP69. 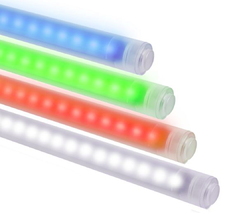 The multicolor WLS28-2 LED strip light feature EZ-STATUS technology and are designed to be used in diverse applications and rugged environments. The entire housing is extremely space-savvy and has a form factor that is hard to miss. There is always a water-resistant option available if required, while the length of models vary from 285mm–1130mm. The power consumption is extremely economical at 9 watts per foot, something that makes the strips the perfect candidate for end-to-end cascaded lighting. 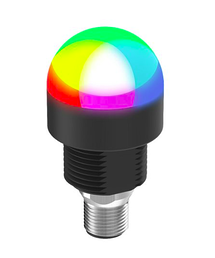 This is a 22mm flash mount RGB indicator that comes with seven color animation inputs and a total of fourteen color options. The light intensity is uniform, bright, and brilliant at all times. 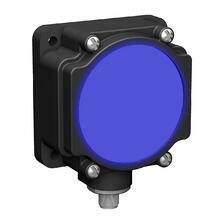 The wide variety of available colors makes this indicator perfect for applications where multiple parameters are at stake. The design is rugged, waterproof, and available in models rated at IP66, IP67, and IP69. All models are made out of materials approved by the FDA, making it acceptable in food and medicine industries. 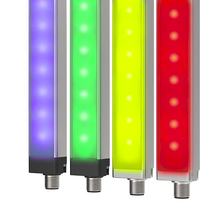 The large K80FL Series multicolor indicator features bright, uniform lighting, and a solid build suitable for simple status indication. Light operation is controlled through an internal DIP switch, and the variety of colors makes it perfect for use in several applications. The indicator features a steady, light gray color when the device is turned off, making it easy to determine when the indicator is in use. The product is sealed to IP67 guidelines and has a large, flat face making it hard to miss even at great distances.